The cranial cruciate ligament (CrCL) or anterior cruciate ligament (ACL) is one of the four ligaments within the knee and is the most important joint stabilizer. Injury to this ligament is common in dogs. The ligament connects the femur (thigh bone) to the tibia (shin bone) and prevents the tibia from sliding forward during normal leg use. CrCL rupture is a common orthopedic injury and the most common source of knee problems in all sizes and breeds of dogs. CrCL injury occurs in the young and old, in athletic dogs and “couch potatoes” alike, and usually happens during normal activities. CrCL injury produces knee pain that causes lameness. Only surgery can restore proper limb stability and function. How Do we “Fix” a Torn CrCL in Dogs? Two popular and effective surgical procedures that provide stability to the canine knee as a result of a torn CrCL include Tibial Plateau Leveling Osteotomy (TPLO) and Tibial Tuberosity Advancement (TTA) surgery. Both surgeries work by eliminating tibial thrust (Fig. 1, which is the transmission of weight up the tibia (shin bone) and across the knee, which causes the tibia to thrust forward relative to the femur thigh bone). 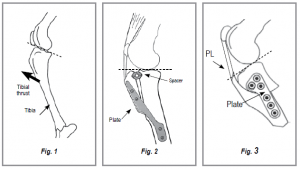 TTA works by advancing part of the patella (knee cap) ligament (PL) until it is 90° relative to the top of the tibia. This neutralizes tibial thrust, even in the absence of an intact CrCL (Fig. 2). The advanced PL and bone is stabilized with a special plate, spacer and screws. TPLO works by neutralizing tibial thrust like TTA, but using a different technique. The top portion of the tibia is rotated until it is 90° relative to the PL. The rotated tibia is stabilized with a special plate and screws (Fig. 3). What Determines Whether a TTA or TPLO Surgery is Recommended? Which surgery is considered best for your dog and why will be discussed in detail during the initial consultation. >90% of surgeries are successful in dramatic improvement in limb function, resolution of pain and return to normal / near normal activity. What are the Complications with These Surgeries? The complication rate for these procedures is low, but infections can develop. When infections do develop, they usually resolve completely with proper treatment. Rare complications include bone cracks and implant failure. Anesthesia itself carries only a small risk of complications. At MedVet, we have a board certified anesthesiologist who oversees anesthesia in your pet. No. Your dog must be evaluated before surgery. This entails a complete medical history, physical examination, and detailed discussion of the recommended procedure. Preoperative blood work may also be performed depending on your dog’s age and health. Most often, dogs go home the day following surgery. Is Postoperative Physical Rehabilitation Important After CrCL Surgery? Yes. Physical rehabilitation helps to return the leg back to pre-injury function. When your dog is discharged from MedVet, detailed instructions will be provided regarding both at home therapy for your pet as well as postoperative follow up therapies offered by MedVet. What are the Chances this will Happen to the Opposite Knee? Between 20 and 40% of dogs will rupture the opposite CrCL in their lifetime. What Happens if I Elect to Not have Surgery Performed on My Dog? While humans with ACL injuries may respond favorably to conservative management (physical therapy and knee braces), dogs do not. The canine knee becomes very unstable following CrCL injury: numerous studies have demonstrated the importance of surgical intervention in improving limb function. Without surgery, persistent lameness and pain are expected. Is a TTA or TPLO the Only Treatment Available for My Pet? No, other surgical options do exist. Many combinations of factors are considered in technique selection, including body size, age, current health status and pre-injury activity levels. Your MedVet doctor will discuss these factors with you during your consultation.